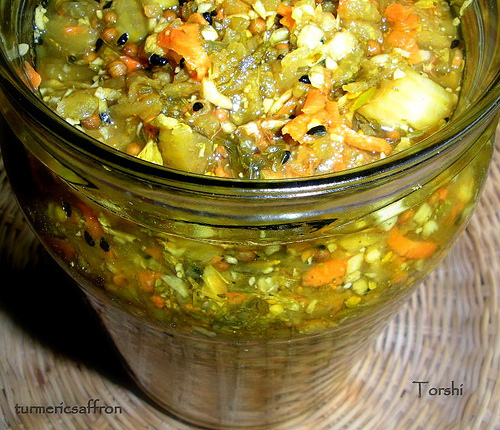 ترشی مخلوط Torshi (pickled vegetables) are the perfect tangy, crunchy and flavorful pickle for your abgousht (lamb soup), kababs, kotlets, polow & khoresh (rice and stew) dishes. There are many different kinds of torshi. This pickled vegetable is a combination of fresh vegetables, dried herbs, spices and vinegar. Salt the eggplants and either bake them in a preheated 350 degrees Fahrenheit oven for 25- 30 minutes or cook them with 1/2 cup of vinegar over medium-low heat for 15 minutes. Set aside to cool. All the herbs and vegetables must be completely dried before mixing them together. Spread out the washed herbs on a table cloth for several hours to dry. In a large mixing bowl combine all ingredients and mix well. Using a wooden spoon pack pickles in clean glass jars up to the rim. Press down on them to make more room as you are filling up the jars. Add more vinegar if needed. Sprinkle a teaspoon of salt into each jar before closing the lid tightly. Store in a cool dry place for at least 2 weeks before serving. 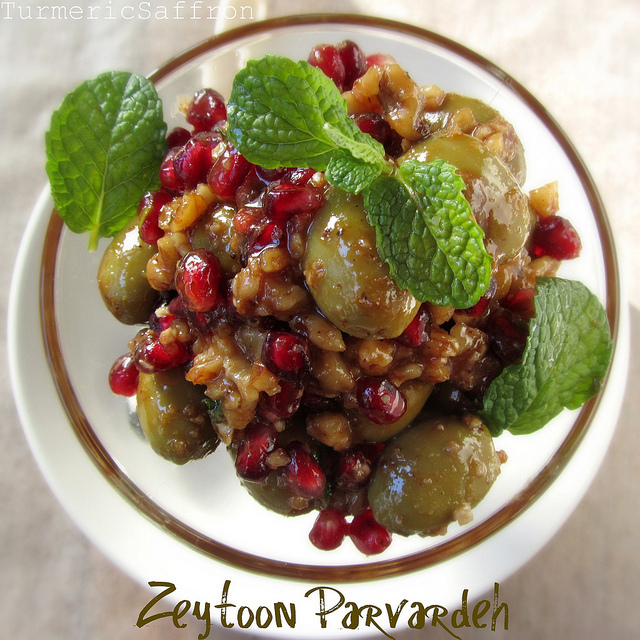 Thank you for posting some great Persian recipes! My husband is Persian and I've mastered quite a few, and my latest "challenge" is torshi. The recipe itself isn't my question however... I have been trying and trying to find a recipe that continues to tell you how to process torshi in a water bath for shelf-stable (non-refrigerated) storage. I could just make some and process it for 20 minutes, but I wanted to find someone who has tried it. This is mainly so I can store it someplace other than my fridge (that is already filling up with other pickled and fermented items!). A "hot water canning" method will work just fine for most pickle recipes. Process the jars in boiling water for 10 minutes and this should seal traditional mason jars with gummy seals. I've been pickling all summer and was pleased to find this torshi recipe! It beats the $10 my Persian grocer charges. Wioletta, if you can’t find limoo amani where you live then you can make your own by blanching small thin-skinned limes in salted water for 5-7 minutes . Add a couple of tablespoons of salt to a medium sized pot of boiling water and then dry the limes in the sun. How much does this recipe make? i.e. how many jars do I need and what size? Sara, it yields about 6 cups and you'll need 2-3 medium-sized jars. I made Torshi for the first time, and followed the recipe...my husband's family usually uses apple cider vinegar....it's been about 3 weeks, and the vinegar taste is stronger than I remember my in law's torshi tasting...any idea why? Apple cider vinegar is milder than distilled white vinegar. if I want to used hot bath canning, won't it make Torshi soft since I am cooking them? Would you suggest ant other way, other than the fridge? You can use hot bath canning and if you prefer a more crunchy pickle you can reduce the cooking time by 5-7 minutes. You can store the pickles in a cool and dry place. I have been making torshi for quite a few years and have never done the hot bath or sealing as you have described. Just close the lid tightly and let it sit. I have opened jars that are a few years old and never have had a problem with it. I believe the fact that it is in vinegar takes care of it for you. Just an FYI for the brave ones!!! Love the recipe, very similar to the one my mother-in-law handed down to me. Thank you for sharing this recipe! Torshi looks super interesting, I definitely want to make this at home. I love how many vegetables are included in this recipe. I'll give it a shot and report back with how it turns out! Hi Azita...My husband LOVES Torshi....I have tried to make it on a few occassions...it was just OK...I used apple cider vinegar, because it's what his mom and sisters use....but when I made it, even after a month of letting it rest, it still was SO acidic....his sister made it recently, and it was also VERY acidic....any ideas? Hi, you can counterbalance the taste of vinegar by adding a little more sliced carrots for their natural sweetness and a little more salt or you can add a teaspoon of honey which cuts the acidity. I prepared a full batch (3.5 kg) yesterday. I left out the vinegar and adjusted the salt content to allow for natural fermentation. I am currently praying to all the gods out there that this goes well because it was quite a lot of work (and vegetables). I hope all the good spices do not mess with the fermentation. Inshallah. If anyone is interested in trying: I used a salt content of 2.5% of the total weight. The salt will draw liquid from the vegetables, so there is no need to add any extra water, unless the liquid from the veggies is not enough to cover everything. In that case: add 2.5% salt to the water as well. It is important to keep everything submerged until the fermentation created enough acid to preserve the torshi on its own. I kept everything in a big jar with some headspace. Gas will be generated and the headspace helps to avoid a mess. After a week or two the torshi will be ready, but it will keep developing over several weeks. The spices and herbs were very dominant with mild acidity after two weeks. The acidity was almost comparable to torshi with vinegar after six weeks at room temperature (~20°C). It is important to use salt without iodine and fluorine! The fermentation process involves lactobacteria that occur naturally on vegetables and they will be harmed by iodine and fluorine.